15-minute instructional class to learn basic freefall and canopy skills. 20-minute airplane ride to altitude over our beautiful Florida-Alabama coastline. One tandem skydiving jump with a professional USPA rated Tandem Instructor. 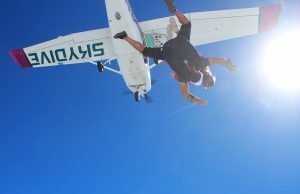 Skydive the Gulf is the closest skydiving center to Pensacola, Mobile, Gulf Shores, and Orange Beach! We deliver the greatest views of the Gulf of Mexico’s coastal waters and sandy white beaches from over 2 miles up! We also offer amazing video and picture packages from skilled videographers. 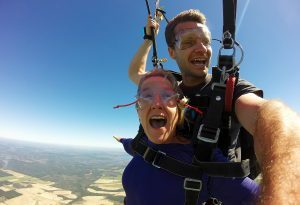 We make it very easy to share with your friends and family after your skydive. 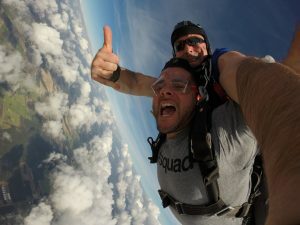 Skydive the Gulf™ contracts the best Tandem Instructors in the industry. Each of our instructors has thousands of skydives and is held to the highest standards above and beyond what is required by the United States Parachute Association. You MUST be 19 years or older on the day you skydive. Please come with a valid photo ID such as your drivers license, ID card with photo, passport, etc. Safety is our number one concern and weather conditions are a major part of tandem skydiving. Unjumpable conditions may include but are not limited to cloud cover, high winds, and/or precipitation. Often times, even if there is bad weather in the morning, we will have clear blue skies within an hour. Your deposit is ABSOLUTELY REFUNDABLE in the case of weather. If you are on the island longer than one day we would love it if you would reschedule with us. We are flexible and would hate for you to miss out on such an unforgettable experience. We do require a minimum of 3.5-hour weather holding waiting period before refunds can be processed. You must weigh 260 lbs or less to participate. These requirements are in place to ensure our number one priority of safety. Students over 200 lbs. will be assessed a fee of $1/lb. We have a minimum of two tandem students per flight. Customers may be assessed a fee for single student flights. Absolutely no alcohol and/or drugs in your system 24 hours before making a tandem skydiving jump. Our airplane is specifically modified for skydiving operations. Our Cessna 182 is beautiful and fast for its kind. We are held to the highest standards for maintenance and our very own Certified A&P Mechanic ensures that our plane is well maintained for every jump. Must wait 24 hours to skydive after SCUBA diving.